Baytree esthetique products are energy efficient. They are proven to help keep the warmth inside your home whilst keeping the cold out and any heat loss to a minimum‚ all this will help reduce your heating costs significantly. The cost saving made from reduced fuel bills outweigh the investment cost over the life expectancy of the window. Government Building Regulations require us to use energy efficient glass products that help to reduce CO2 emissions and protect the environment. These regulations have recently been updated to include a Window Energy Rating scheme which assess the overall energy efficiency of a window and offers a further means of compliance. Part L of the Building Regulations for England and Wales (and Part F in Northern Ireland) includes Window Energy Ratings (WERs) as an alternative method of compliance. 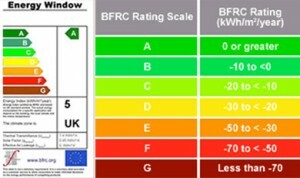 The minimum level for replacement domestic windows is band E. For windows in new domestic extensions, the minimum requirement is band D. Additionally, in new dwellings, BFRC Ratings are now being used to guide building professionals towards more energy efficient design and building components. Using thermally insulating Double Glazing, or preferably Triple Glazing, is the best way to improve the energy efficiency of your windows and make your home environment more comfortable. Improved thermal insulation – reduced heat loss saves you money on your heating bills. Promotes passive solar heat gain – free heat from the sun passes easily through the glass helping to warm the home. Improved energy efficiency – reduced need for heating helps to save energy and protect the environment. More comfortable rooms – improved thermal insulation means fewer cold spots and drafts near windows and doors. Less condensation – the inner surface of the glass stays warmer, reducing internal condensation and prolonging the life of your windows. Low-E Glass : High performance low-E glass such as Platinum Plus can significantly reduce thermal losses compared to traditional products. Inert Gas Filling : Argon gas filling a double-glazed unit further reduces heat loss. Low-Iron Glass : Specially manufactured to be significantly clearer than standard glass allowing better transmission of solar heat and light. Increasing Glass Area : Changing the frame design to maximise the glass in the window allows for greater solar heat gain transmission.